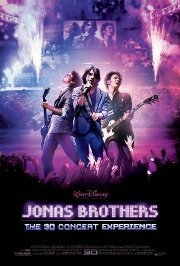 The Jonas Brothers, of Camp Rock fame, went on tour recently, and Disney sent the cameras along. Get up close and personal in digital 3D as you see scenes from their various concerts, as well as go backstage to see what real life with the brothers is really like. At the time of writing, this film was number 5 on the IMDB's Worst 100 movies.